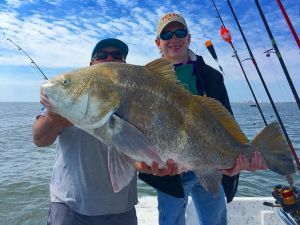 The Fishing Report for Galveston Bay has seen a slight change than what normally is occurring this time of year. 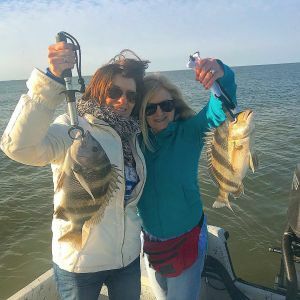 Are our Galveston Spring Breakers catching some awesome fish? Absolutely! Are we catching the fish in the same areas as usual – No we are not. Two major factors have been established this year that affect fish patterns, activity, and areas of concentration – Major Fresh Water Flood and Coldest Winter in a decade. Our jobs as Galveston Fishing Guides are to adapt. First, we will address the enormous amount of fresh water that flooded our Bays from Hurricane Harvey. Bayous, creeks and rivers poured fresh water into our Galveston Bay System this past September like I have never seen in my lifetime. Has Galveston Bay ever seen this kind of fresh water flow before? Without a doubt it has, and sure it will again. Fish survive. Fish adapt. Fish Talk. Fisherman must adapt and listen. The month of March, generally is a month of intense Big Sheepshead catches. Yes, we are catching the sheepshead, aka BaySnapper in good numbers, however we are seeing a slight change in the sheepshead areas of concentration than from years past. With the large amount of fresh water flooding our bay system and outpouring into the Gulf – fish scatter. It may take a while for the fish to concentrate in the same areas as before. Then again, the fish may never concentrate in the same areas as before. When something like this occurs, it may harvest the beginning of new areas of concentration until another major natural event occurs. “Areas of concentration” do not mean leave the bay, or the general area. Major passes, mouths of creeks, bayous and ditches will still be keys to bait concentration and natural habitat. To anglers that target certain stretches of shorelines, jetty rocks, or points of reefs – a change may very well occur. Do not get stuck in the mindset of “this is where they are supposed to be… because they are here every year at this time”. An open mind on the water is a key to better understanding the fish. Fish Talk – we have to listen. Second affect Mother Nature gave the Texas Coast this year was a much colder than normal winter. Galveston experienced snow as many times in 2017-2018 winter as it had in the past 10 years. No, this was not a hard freeze that killed thousands of fish. However, it did make thousands of fish adapt and move into areas of deeper waters to survive. When an entire Bay System of fish move to a handful of deep holes to survive – it may take a bit for the patterns to get back to “normal”. What is the definition of normal to a fisherman? The tendency to fish the same old “normal” spots as done in the past by what month it is. This keeps a fisherman’s success rate from its full potential. What is “normal” to a fish? Surviving. Eating. Spawning. Our Galveston Fishing Guides have been catching numbers of Bay Snapper along the Galveston and Freeport Jetties on live shrimp. Black Drum are good on cracked blue crab. Speckled trout are being caught on live shrimp over oyster reefs, and plastics while wade fishing. Back lakes and bayous are producing some nice slot red fish and puppy drum. The fishing in April will continue to see good numbers of Bay Snapper being caught along the jetties and bay reefs. 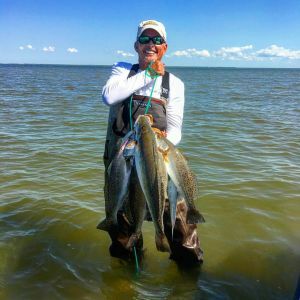 Speckled Trout and Red Fish will begin to be caught in larger numbers as water temperatures continue to rise. April will also see our flounder gigging charters begin to have more success as winds should begin to lighten, and water clarity increases. Big Drum will still be caught, and our Galveston Shark Hunts will begin with the increasing water temperatures. 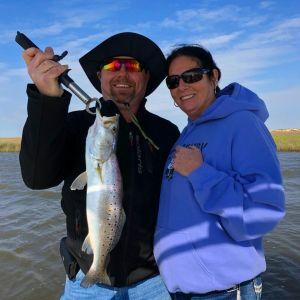 The end of April and into the month of May is a great time for our more experienced clients to book a trophy wade fishing speckled trout trip. On these trips, we will fish for specks and reds using plastics and topwaters. This is a great time to catch a Trophy Speck! Bay’s Landing, our new Waterfront Fishing Lodge has been a great place for Spring Breakers to relax and catch some nice fish. 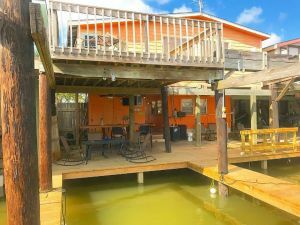 With our charter boats picking you up from the back porch for a day of fishing, the beach only four miles away, and an amazing patio to grill up your fresh caught fillets – Bay’s Landing is everyone’s favorite! We are now booking up for April, and are very excited to offer our valued customers an affordable place to stay while visiting us and going fishing! Give Captain Greg a call at 409-739-8526 to book your fishing package today!